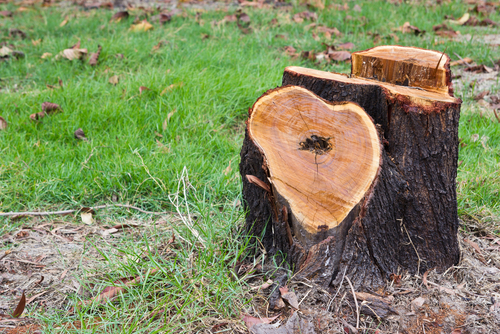 How to Rot Tree Stumps | Mr. Tree, Inc.
Look out your window and throughout your yard. What do you see? Trees flowering in the spring and exploding into color in the fall? Lush green grass that carpets your space? Plants that burst into life throughout the year, adding color and ambiance to your landscaping? Tree stumps that mar the view? Here in the Pacific Northwest, trees are a part of our culture. It’s hard to imagine a home without a variety of trees surrounding our four walls. But occasionally those trees become a nuisance. They die from bug infestation or are damaged in a storm. They must come down, and in the process, an ugly tree stump is left in its shadow. What can you do with a tree stump? If you feel like getting creative, you can recycle it and use it in other ways. How about a dining room table? A planter? Or even a bird bath? But in most cases, tree stumps are in the wrong spot, take up valuable space, and ruin the way your landscaping flows. The best course of action is to get rid of the tree stump once and for all. And the best way to do that is to hire a tree service that can do it the right way the first time around. There are two major disadvantages to turning stump grinding into a do-it-yourself venture. Do a quick search online, and you’ll find many stories of accidents that involve stump grinders. What about manually removing a stump? It’s an option. But it also has a couple of disadvantages. 2. What do you do with it once it’s removed? What you’re left with is a sometimes a large piece of wood that is hard to dispose of. Most trash companies won’t pick it up. And there are only so many craft projects you can do. Another option is to let it rot away. How long it takes a tree stump to rot depends on a variety of things. How large was the tree? A stump of a large tree can take as long as ten years to rot away without treatment. That’s a long time to wait to do something else with your landscaping. There is another option: chemical stump removal. This is a process that speeds up the natural breakdown that a stump moves through in nature on its own. The first tool of the trade is a chain saw. Cut the stump down as close to the ground as you can. Don’t allow the chain saw to make contact with the ground, as this can dull the chain. This can be dangerous; be sure to wear steel toed boots for this part of the job. When the tree is as low to the ground as you can get it, drill holes a few inches deep into the stump in various locations. Use the widest drill bit possible; the deeper and wider the holes, the better. Fill the holes first with water and then a fertilizer high in nitrogen. Cow manure can do the trick. So can a commercial fertilizer that is high in nitrogen. Look for fertilizer in which the first three numbers of the fertilizer’s NPK is the highest – straight nitrogen fertilizer would be 45-0-0. Soak the ground all around the stump. In this case, standing water is okay. The stump should clearly be wet over the top and around the base. Cover the stump with a plastic tarp to help retain the moisture in and around the stump for as long as possible. Moisture is your best friend throughout this process. Next, apply organic mulch over the top of the plastic tarp. Water the mulch thoroughly. By using organic mulch such as tree bark or hay, it will help retain the moisture and keep the area as wet as possible for as long as possible. Wet mulch is heavy, which will help keep the tarp in place. Depending on your landscaping, you can use rocks or heavy stones to weigh down the tarp further and keep it in place. The final step is patience. This method speeds up the process nature takes care of on its own. But it is in no way a fast and easy process. You won’t be able to quickly incorporate the area of the downed tree into your landscaping plans set for this year. You can speed up the process by periodically removing the mulch and tarp for a moment, thoroughly soaking the stump and the ground around it once again. If you still have nitrogen, you can add more of it to the holes. Then reapply the tarp and the mulch and soak it once again. Repeating this process works over time. If you’re worried about the impact of using too much nitrogen in your landscaping, you can always try good old fashioned Epsom salt. Epsom salt is another term for an inorganic salt that contains sulfur, oxygen, and magnesium. It’s another way of providing nutrition to the soil. Epsom salt also has the ability to draw moisture out of the surrounding area, and in the case of a tree stump, can work at rotting it at its core. Use Epsom salt in place of the nitrogen, keeping the area moist and covered during the process. Of course, the easiest and safest way to get rid of an old tree stump quickly is to call your professional tree service. If you have a question about tree removal, we have the answer.